Along Came Jones (Stuart Heisler, 1945) is a genre film centered upon subverting its own genre. It may seem like a Western, but pay attention, it makes fun of everything that Westerns are based on: masculinity, the hero concept, and, most importantly, Gary Cooper-as-Western-icon. While many Westerns have a dark edge and still others are considered Western noirs, this one is unusual in its inclusion in film noir books and comedy texts. Women definitely have their place in the Western. While that place can be progressive (to an extent) the role that Loretta Young plays in Jones is even more revolutionary. From beginning to end, Along Came Jones is a wholly different kind of Western. This is not your mama’s cowboy movie and it needs to be seen to be believed. Cranky old Bosley Crowther of the NY Times actually liked the film. 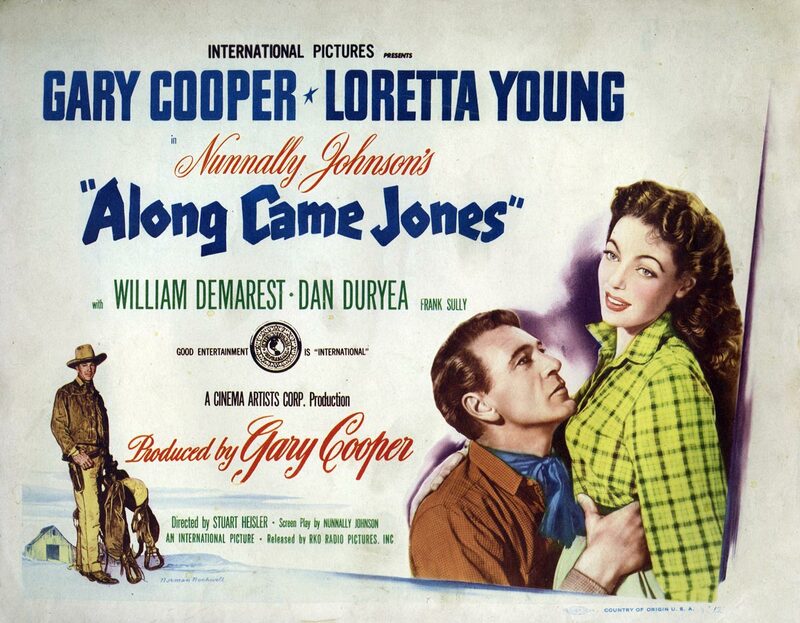 In his July, 1945 review, Crowther said that Along Came Jones was “one of [Gary Cooper’s] nicest (though less important) pictures in several years.” While that may seem like a backhanded compliment, he also said of the cast and plot that Gary Cooper was perfect as the lead character, Melody Jones. “[he] is a most congenial gent—butter-fingered and mentally clumsy, but disarmingly winning withal. And Mr. Demarest is lustily amusing as his non-singing, cynical pal. Miss Young is fair as the distraction, and Dan Duryea is as ugly as a snake in the role of the slick and fast-shooting evildoer.” To get a positive review out of Crowther was like pulling teeth. This was impressive. 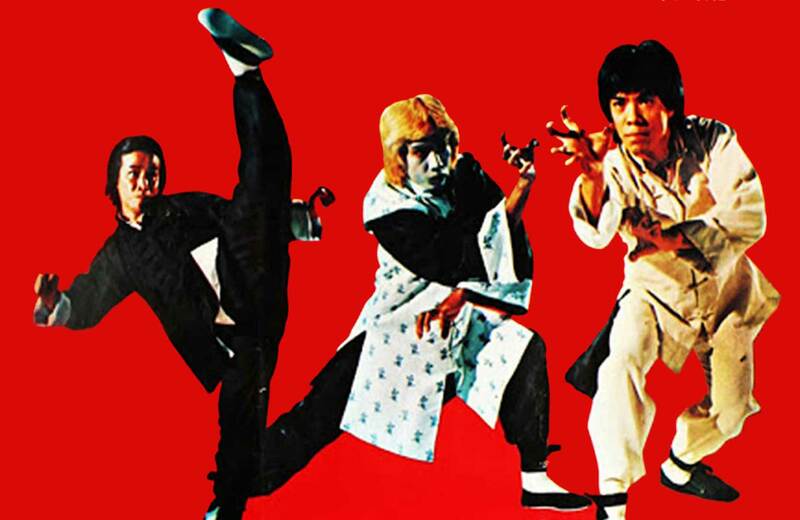 Unfortunately, this was not enough to make the film financially successful. It was not a winner in the box-office, forcing Gary Cooper to return to films that did not stray from the image Hollywood had created for him. He had originally wanted to do Jones in order to open up new avenues for himself as an actor. He was tired of being pigeonholed and typecast. He thought that by poking fun at himself it would show Hollywood that he had a sense of humor about his career and place in the industry. Cecil B. DeMille had something to say about Cooper’s performance in Jones. “If you kid a hero, you are doing yourself damage.” DeMille said that no one wanted to see a parody of a hero, they only wanted to see someone who could handle a tough going when the going got tough! This disappointed Cooper greatly. Cooper also wanted to be getting more from what he was putting in. Hollywood was going through a lot of changes at this time. Everyone was going independent. John Ford had his own gig, Hitchcock had split from Selznick and gotten his own thing producing and directing, James Cagney created his own company, Cagney Productions, in 1942. While studios were still the primary Hollywood structure, Gary Cooper realized that if he created his own production company, he would reap more of the benefits, financial and creative. In 1944, Cooper established International Pictures with William Goetz (departed head of Twentieth Century Fox and the Son-In-Law of Louis B. Meyer) and Nunnally Johnson (head writer at Twentieth Century Fox). Cooper produced exactly two pictures with International before realizing that it was definitely not his bag: Casanova Brown (Sam Wood, 1944) and Along Came Jones (Stuart Heisler, 1945). International later folded into Universal, but before that, Gary Cooper tried his hand at being a film independent. It wasn’t so successful. While the tall handsome Iowan with a crooked smile was certainly a charmer on-screen, he didn’t quite understand the economics of filmmaking. It’s documented that on the set of Along Came Jones, Cooper was overly concerned about the cost of Loretta Young’s wardrobe. He wanted to know why the designs were so expensive. The reality was that the way they were going to be made was better and out of a tougher material, more appropriate for shooting a Western. However, that didn’t phase Gary Cooper. What did make him back down was the idea of having to explain to his beautiful co-star why she couldn’t have her originally promised costumes! Along Came Jones was based on a novel by Alan Le May called Useless Cowboy written in 1943. The first of several of Le May’s novels made into films, Cowboy is the only one whose adaptation is not currently considered a “Western Cinema Classic.” His later novels, The Searchers (1954) and The Unforgiven (1957), were given the Ford and Huston treatments respectively and have since become part of the American Western film Canon. Along Came Jones/ Useless Cowboy is a very different kind of Western. Both Le May and Cooper were really trying to do something different by introducing this work to the public in 1945, but unfortunately this was a case of something being way ahead of its time. Not only was the novel parodying the genre, but the film is self-aware and showy in that knowledge, something not done again until films like Cat Ballou (Elliot Silverstein, 1965). 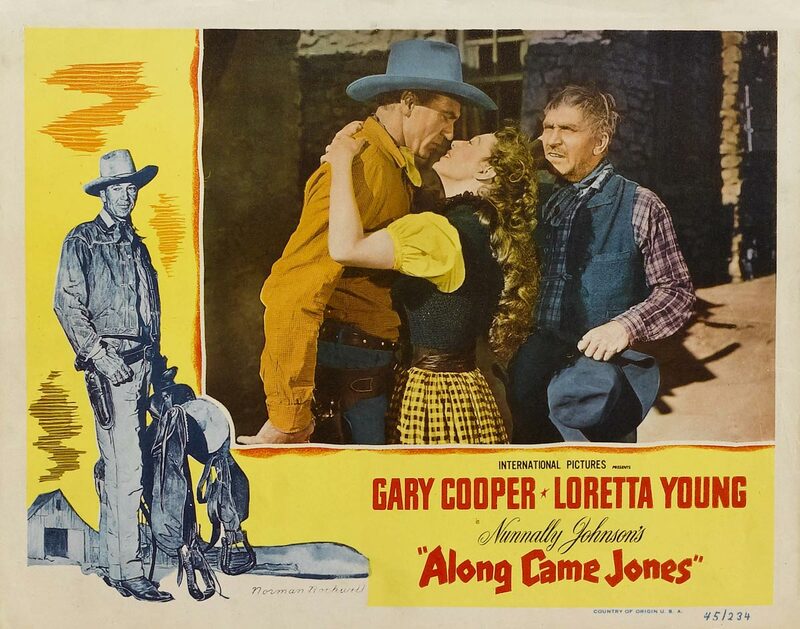 The working title was American Cowboy and it told the story of Melody Jones (Gary Cooper), a clumsy but well-meaning dude who gets mistaken for the desperate gunslinger, Monte Jerrad (Dan Duryea). As Jones has the same initials as Jerrad, the townsfolk believe him to be the outlaw, thus plying him with free drinks, not getting in his way, being respectful/fearful. This gives Melody a feeling of confidence he’s never had before. His “partner in crime,” George Fury (William Demarest), is uneasy about the whole set-up and becomes even more nervous when it turns out that it is a dangerous game after all! The beautiful Cherry de Longpre (Loretta Young) gets involved and everything detonates like explosives in a coal mine! While Gary Cooper was well into his Hollywood life by this point, Dan Duryea was only getting started. 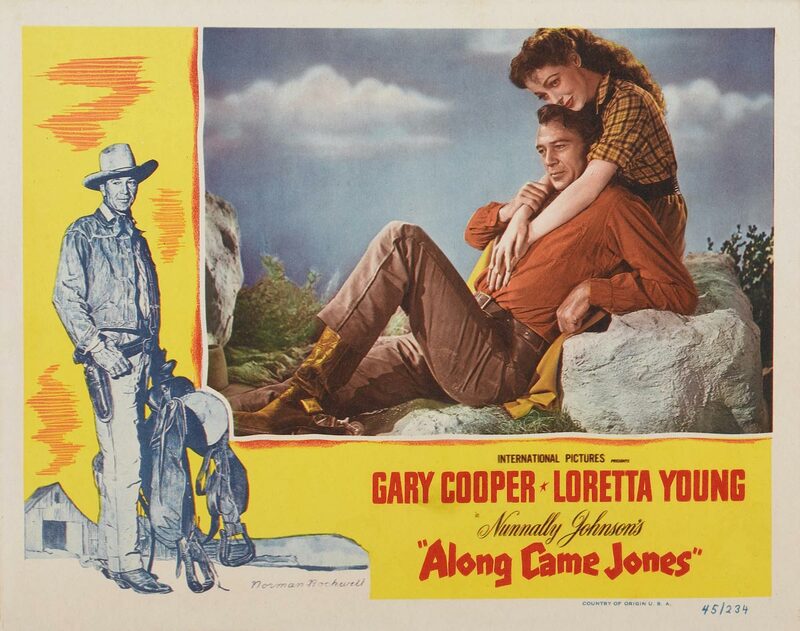 He had been in two pictures with Cooper – Ball of Fire (Howard Hawks, 1941) and The Pride of the Yankees (Sam Wood, 1942) but Along Came Jones was his very first Western. Duryea went on to be in many Westerns, from film to TV, but this is where he first learned the ropes. According to the literature, Duryea gives all the credit to Gary Cooper for teaching him how to handle a gun, how to be comfortable with horses and, quite simply, how to be a cowboy. For a man whose acting gifts ranged from heroic to horrifyingly twisted, Dan Duryea hated guns and was terrified of horses. Gary Cooper did a great job of working that fear into the vicious confidence that was Duryea’s cinematic calling card throughout his career. Along Came Jones is funny. Like, laugh-out-loud funny. But it gets dark too. Following Melody Jones on his exploration of self and identity is a trip in and of itself. He really feels important when everyone thinks he’s a criminal! He thinks that all you have to do is go into the saloon, look serious, and that’s all there is to it. Then again, he doesn’t know that everyone thinks he’s the deadly Monte Jerrad. In some ways, Melody Jones is an offshoot of Professor Bertram Potts, the character he played in Howard Hawks’ 1941 film, Ball of Fire. His experience with the criminal element is minimal and he approaches everything with the utmost innocence. This drives his much more streetwise friend George crazy. 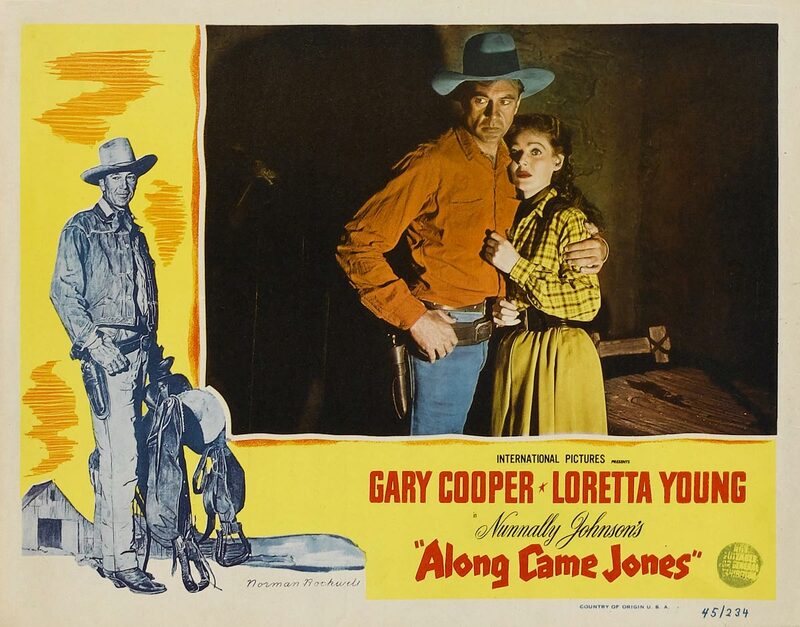 Jones moves at a good pace, allowing the bumbling main character to cross every “t” and dot every “i” of a Western but from a parodic perspective. More than anything else, Melody Jones is like every other Western hero: a Man’s Man. Until that gets flipped too. The audience realizes that without Cherry, our hero would be no more. So is it that the roles are being reversed too? Is this film’s subtext that the women that have been portrayed as second-class for so long in the Western genre are actually the real heroes? Along Came Jones would have you believe so. And it is a welcome and refreshing realization.